Millboard Sheets, Millboard Discs by Hindustan Composites Limited. 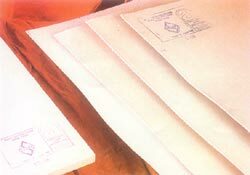 This is a versatile thermal insulation and heat resistant material produced in sheet form using good quality fibres incombustible fillers and vegetable binders. It dose not suffer loss of strength upto 485°C. When suitably supported the board can be used satisfactorily at extreme temperatures upto approx. 1400°C. For all kinds of thermal insulations ranging form domestic cookers and ironing boards to industrial applications such as glass moulding ovens and furnaces. As the sheets can be bent to any diameter with a little moisture they are most suitable for larger diameter pipe cladding.